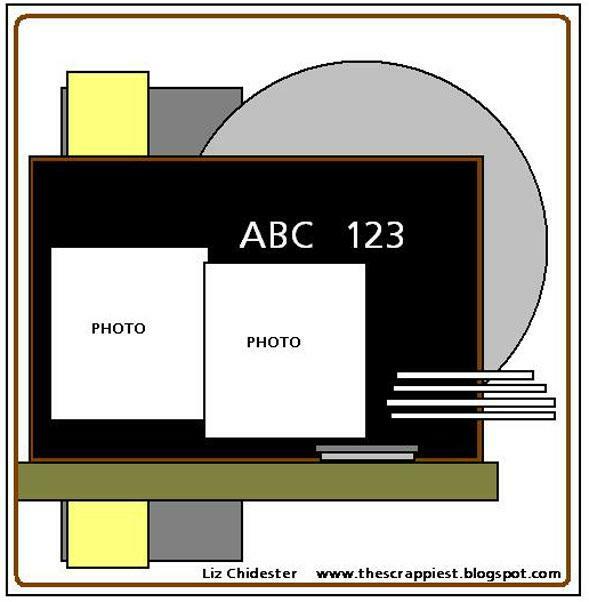 This post is kind of fun because I made this layout from pictures that my sister took on her phone and uploaded to Facebook while she was at the zoo in Oklahoma with my mom, dad and brother. Have you ever done something like this? Copy any pictures off Facebook?? I turned the sketch and used some paper from My Minds Eye. I made the lollipop flower and used some ribbons from my stash and a nice swirl rubon. I spritzed the heck out of it with Glimmer Mist in bronze. It was just a fun layout to do. It is the final (I think) sketch (#14). You still can participate in the Sketch A Thon. 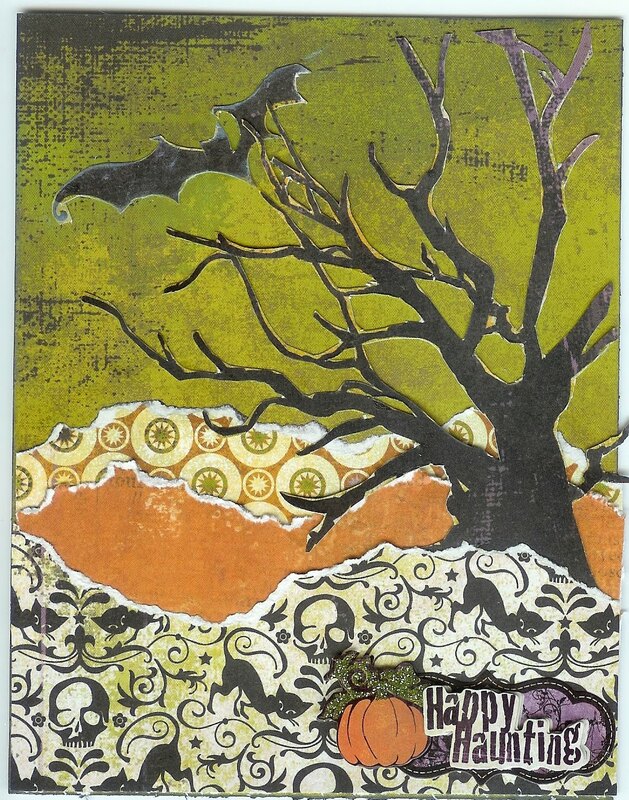 You have until Oct. 4th to post your creations. There will be tons of prizes!! So rush on over and get busy!! 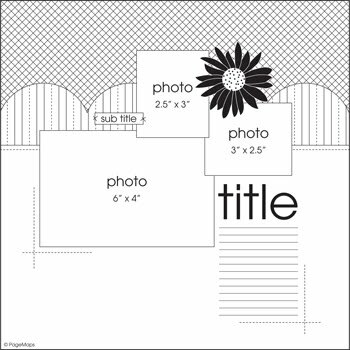 I am feeling a little silly because I made this layout several days ago and totally forgot to post it (anywhere!). 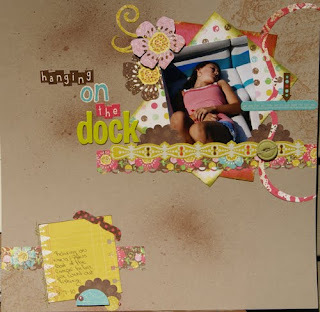 LOL It is a scraplift that I did for Stacy R's Monthly Challenges at Sketches4you. It was a nice little break from Fall/Back to School/Halloween. That is all I have been scrapping for the last few weeks. 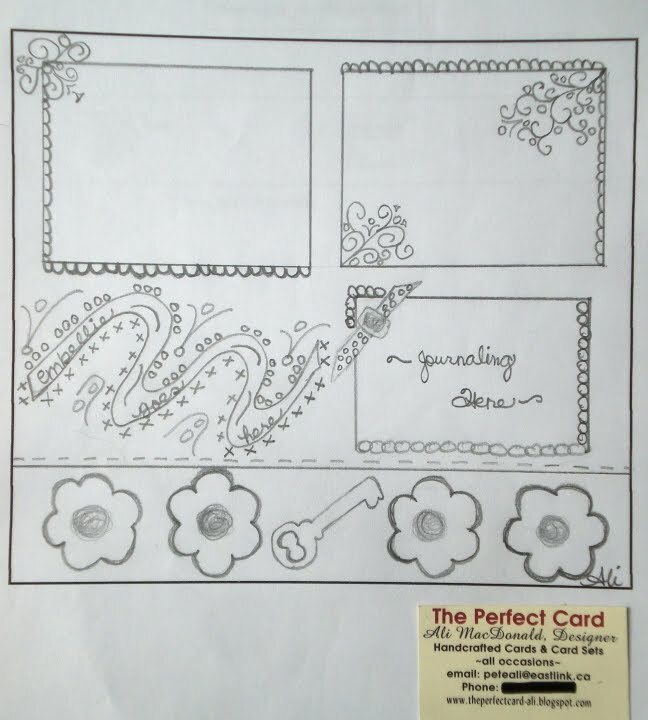 Stacy's original layout is really pretty and so summery (don't you think?) My subject matter is a little different. It is about a time my two oldest boys, my goddaughter and I were stranded during a snow storm in a tiny smoking room at Motel 6 in Santa Rosa, NM for 4 days with 2 of us sick and 4 dogs (one of which would NOT go to the bathroom #2 - and didn't for 4 days!) (TMI - I know! lol) We only had snack food and water although this little town is used to snow storms and keeps its Main street plowed so we did try to get out to eat once a day. The highways around us were all closed. Miserable! I used paper from My Minds Eye Glitter book Signature Christmas. (all of that paper is beautiful!) And a gorgeous flower strip from Bo Bunny. It is so yummy I could just eat it up!! lol Ribbon from my stash, crystal Stickles, random snow flakes from my stash. 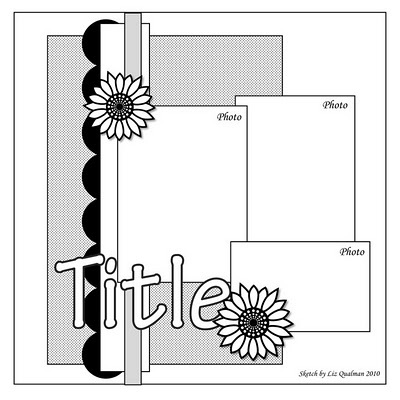 I also made this next layout for the Sketch A Thon at Sketches4you (link on the sidebar). It is for challenge #13. I really liked this sketch a lot. It was such a fun layout to make. I used some old Halloween pictures of my youngest son. He is wearing his older brothers Halloween costume. My older son never got to wear it because he was too sick on his first Halloween to bother dressing him up. Anyway, I think Riley looks adorable in these pictures (if I do say so myself! lol). We met with Realtors yesterday to try to decide which to work with and to get this house selling started! Wish us luck!! Hello and I hope everyone is having a great Monday. I made this card yesterday but since I had already posted once, I decided to wait to post it until today. 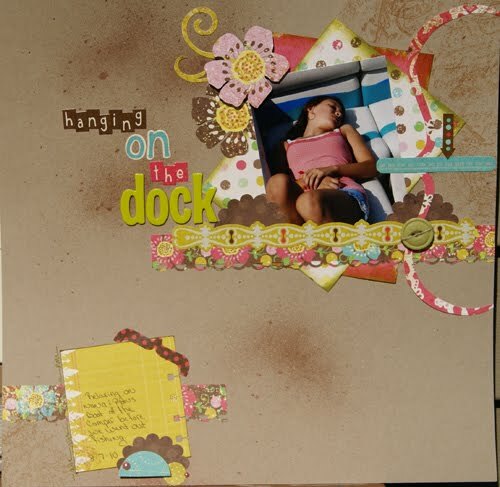 I made it using scraps from my last layout. And some bling and a bit of ribbon from my stash. Today I posted MY Sketch A Thon sketch. (SAT) I didn't personally make it. (the sketch) It is a Pagesmaps sketch. I gave everyone a little advance time to work on this by posting the sketch as my card challenge for September 15th at Sketches4you. 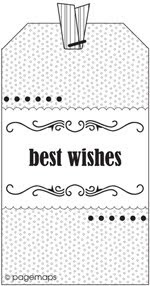 I made the Wishing You Were Here card to show as an example when I posted it then. Now that I am posting it for the SAT, I decided to make a new card to help inspire people to participate! So really if you make this card you can qualify to enter into two separate challenges and be up for two separate RAKs! 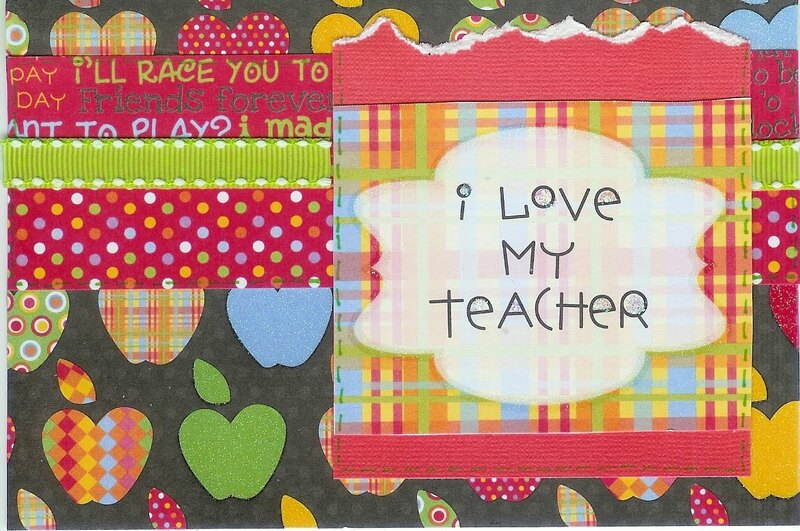 And if you make it with a fall/back to school theme. You get your name in the hat twice on my card challenge and you get two points in the SAT. Does that make sense? If not ask me questions and I will answer them. But what you should have gotten out of that was that you should run...not walk...to Sketches4you (link on sidebar) and do this contest and post it in both challenges. As we were cleaning yesterday, I only had time to scrap this card. But we did try to end the day with some fun time with the kids in the pool. The water is still warm (from the sun - we have no heater)(we live in Las Vegas). Hopefully I will still have a little break to scrap today. I should already be cleaning but needed my coffee and to catch up on the computer. I hope you are all having a marvelous weekend and I want to send out a birthday greeting to sweet Lara who is 3 today!! Welcome to the Terrific Threes!!! We love you girl!! Sadly, (for me) this is going to be a house cleaning day...boooooo. Obviously you can tell I am not that in to house cleaning. We are getting ready to put our house on the market to sell and we need to make it all sparkly and clean. The housing market in Las Vegas is in the tank so I am not getting my hopes up but we have been transferred and we have to try to sell. Hence....the house cleaning. The really bad part is when they start showing our house....I will have to try to keep the house clean ALL THE TIME (?!?!?) and take 5 kids and 3 dogs away from the house while they show it. What can you do with 5 kids and 3 dogs....?? It kind of limits you. I am thinking I will try to keep a "house showing" kit in the car with dvd's, books, snacks and bottled water. 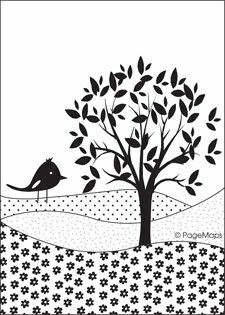 Today you are getting cards and a tag... 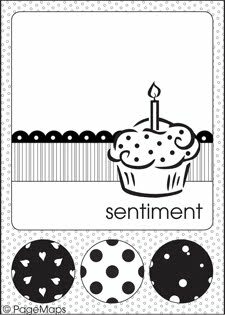 I made these cards and tag a few days ago but have been posting all my layouts and just haven't gotten around to showing them to you. So here you go. 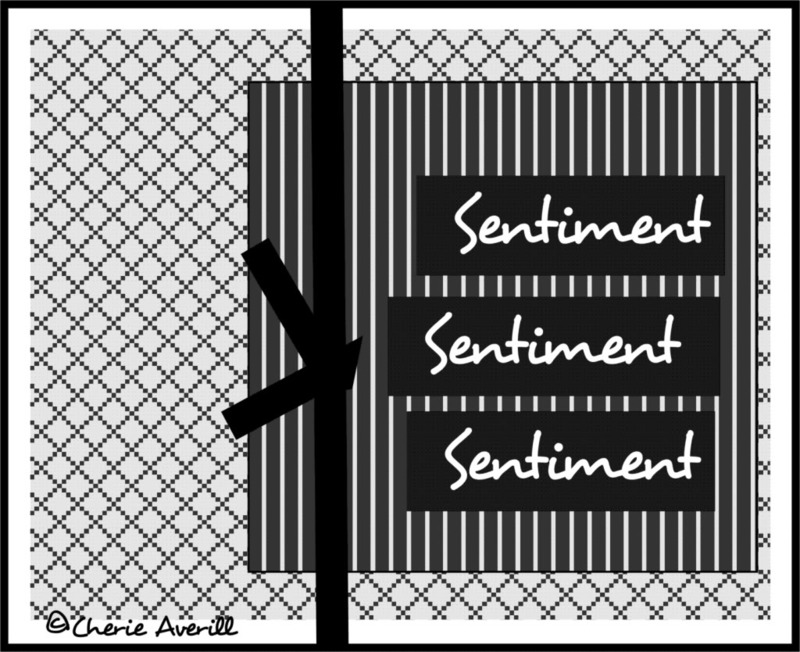 Here is the newest sketch challenge posted for the Sketch A Thon at Sketches4you. It was posted by Michelle and it is Sketch #11. It is a beautiful sketch. I really enjoyed making this layout. 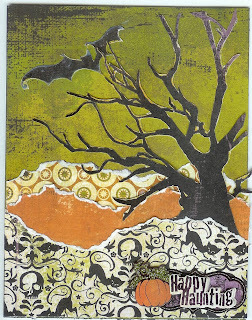 I used some Indian Summer paper from Basic Grey. 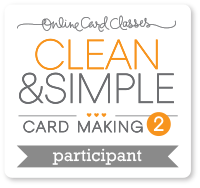 I used a Martha Stewart punch to do the edge punching on the card stock. I spritzed these white flowers with Burnt Red Glimmer Mist. I had the swirls but they were in Black glitter so I re-glittered them gold to match. I used my i-rock to add some bronze bling and my gold stickles for some extra sparkle. I like how it came out and these old picture of most of my kids (this was taken before my 5th was born) are fun. We had just finished soccer practice and they were messing around. I always took my camera and I got a couple of cute shots. I can't believe it is already Friday! This week really flew by quickly. I hope everyone has a wonderful weekend. 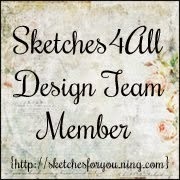 Please check out Sketches4you (link on sidebar) this Sunday. I am posting my Sketch A Thon sketch and would love to have as many people participate for the RAK as possible!! 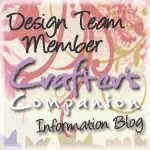 Make it Crafty is a fab blog and you will be happy you went and took a look. Jessica at http://pretty-ladies-scrapbooking.blogspot.com/2010/09/october-my-minds-eye-giveaway.html Pretty Ladies Scrapbooking is having a great giveaway. Run check out her blog and see if you might like to try to win it! She has a great blog and some yummy candy. We are so excited at Sketches4you because we have the wonderfully talented Nikki Sivils as a guest designer for the Sketch A Thon (SAT)!! Yesterday they posted the sketch that she made especially for our SAT. It is gorgeous! 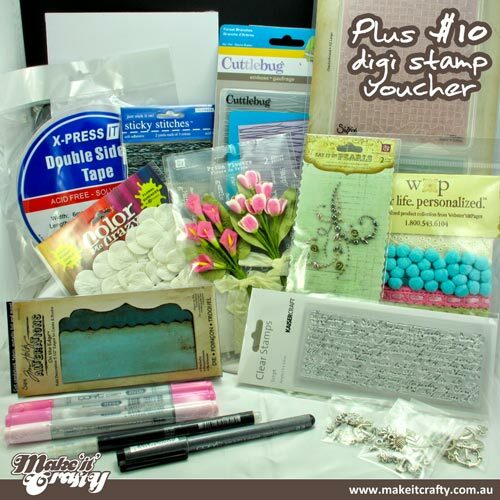 She was generous enough to send our dt members some of her awesome product to use and we all made 2 things. 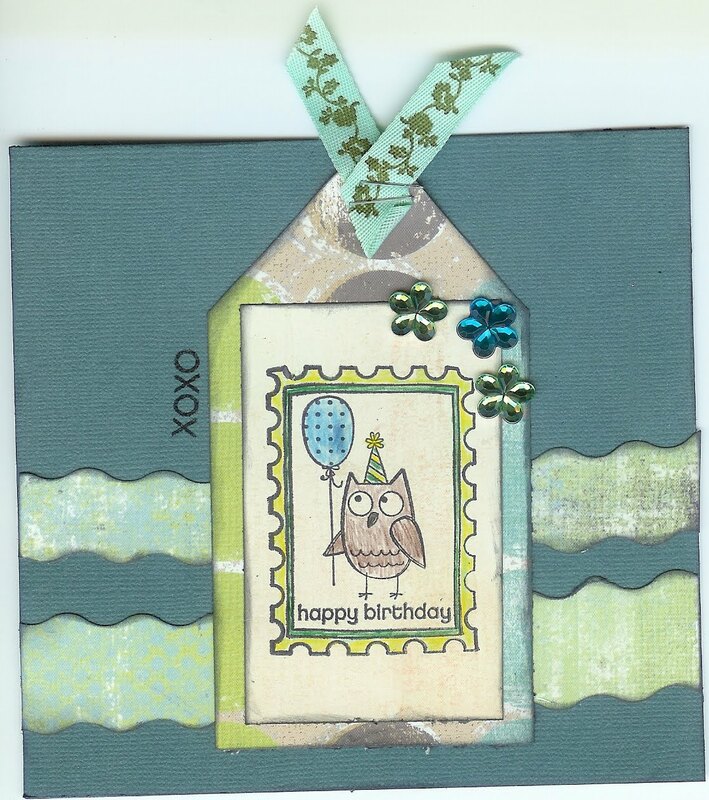 Some did two layouts (like me) and some did a layout and a card. All of us using the same product. It is so cool. It really shows you how many different ways one thing can be used. How really versatile it is. I made these two layouts and still have a ton of it left to play with. We just got back from taking one of our cars in for servicing..(oh the exciting life I lead...lol) So now I am off to the park with my daughter. She will be giving them away on October 1st so if you are interested you better rush over and check out the cool project she made with all these goodies and then sign up!! Here is my lovely layout I am going to share with you today. It is from the Sketch A Thon at Sketches4you. This is sketch challenge #8. I live in Las Vegas so it is not really very "fall" here and my ds broke my camera the first day of school so not many current school photos to use....soooooo it really limits my creativity for this Sketch A Thon since our theme for it is supposed to be Back to School or Fall. That is why you are getting soooooo many Halloween layouts and cards. I have tons of Halloween paper and many old Halloween pictures of my kids to share. I'm still not totally up to par - still feeling a bit puny so I am going to make this a short post. So I am sad to say my ds did not win the election. And even though he is disappointed he has a good attitude about it. We talked about how much fun he had running, how proud we all were of him for putting himself out there and trying and about how he is glad that he ran. So he is okay. I'm not really feeling the best right now. I have a bit of a cold so I haven't been moving too quickly today. Luckily I have something I already made yesterday to post today. 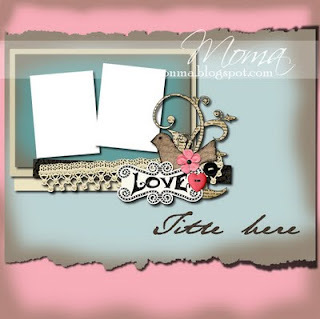 I did Fia's Sketch Crazy 2nd September sketch challenge at Sketches4you for this layout. 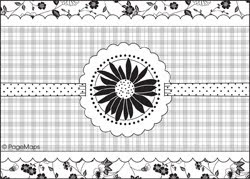 I combined it with the September Let's Ink Challenge that Denise has going on at Sketches4you which is to ink your title. 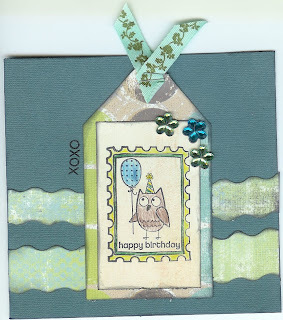 And I used it as an example for my September 20th Stash Challenge at Sketches4you which is to use Rubons. 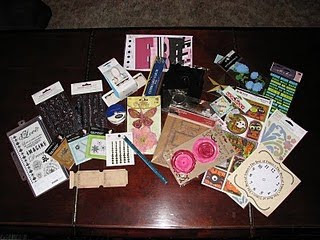 I used stuff from a grab bag I got of Breaking Free stuff from My Minds Eye. (LOVE IT ALL) Most of the stuff I used was from this kit. I also stamped a few things on here, and inked a few things and journaled along the bottom. You should really check out all the fun stuff going on over at Sketches4you (link on sidebar). Tons and tons!! The Sketch A Thon (SAT) is still going on at Sketches4you. (link on sidebar) It has been a blast so far and it goes on for the rest of the month. There are sketch challenges added every other day so there is tons to do. 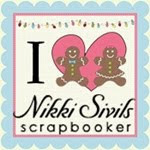 Tomorrow I believe we are going to get to see the challenge from one of our guest Designers - Nikki Sivils!! Woo hoo!! I can't wait! They are loaded with stuff and so inexpensive!! You should check them out! The reason I mention them is that I used paper and embellies that I got in my grab bags to do these layouts. I bought a ton of paper (did I mention I am a paper addict??!! lol) so it was hard to narrow it down. Still no word on the election results...I won't find out until this afternoon if my son is the school historian. Still crossing my fingers. 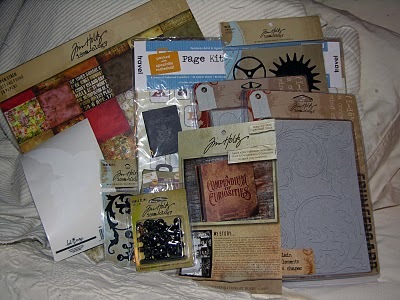 Here is another great blog candy with tons of stuff from Tim Holtz and a few others. He has a ton of yummy candy. You should rush over and check out his awesome blog. I used Tim Holtz paper and some white Prima flowers that I inked with Ranger inks and then spritzed with bronze glimmer mist. Added a button from my stash of buttons and a bit of twine tied off. I really liked it fine before I added the flower but thought it would look to plain to enter in a contest that way!! 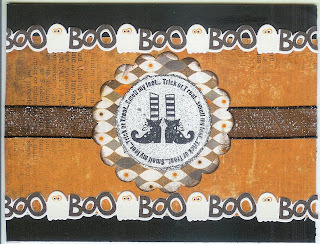 LOL I entered it into this months Altered Item Challenge at Sketches4you. 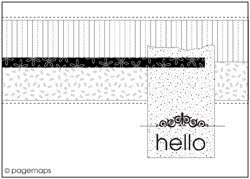 The layout I am going to show you is for the SAT Sketch #2. And I am combining it with the Compendium of Curiosities challenge at http://studiol3.blogspot.com/2010/09/compendium-of-curiosities-week-14.html StudioL3. This weeks challenge was to do masking. 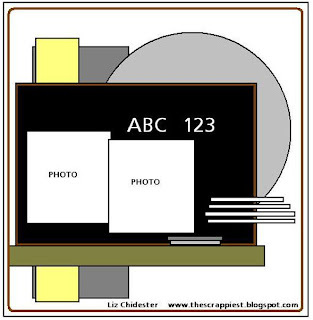 And I also entered it in the Distressing Challenge at http://abc-challenge.blogspot.com/2010/09/d-is-for.html ABC Challenge Blog. The SAT requires you to use the Back to School or Fall theme. Well, I need to run take my boys for a haircut....picture day tomorrow... Have a good Sunday. Happy Saturday. And it is a happy Saturday here in my house. Kids are playing, I'm scrappin...all is good. First I want to thank everyone (and he does too) who left encouraging comments for my son regarding his speech! He did an AWESOME JOB! Can you say...PROUD MOMMA??!! Even if he doesn't win I am so happy with the great job he did and that he put himself out there!! GO QUINN!! 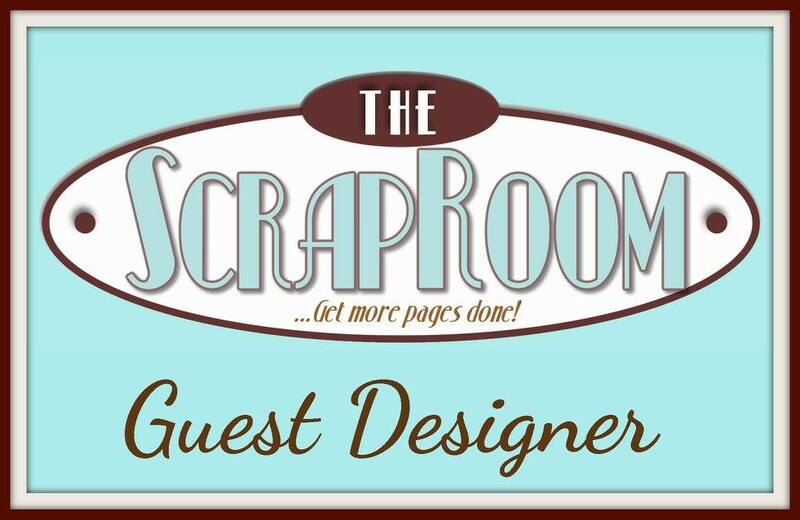 I can finally post this layout I made for my GDT job over at Scrap Our Stash http://scrapourstash.blogspot.com/ . 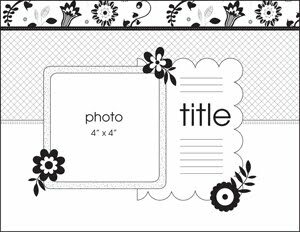 The challenge this month is to use a border punch. I decided to use my new Martha Stewart punch. I think it is supposed to be scary branches...I tried to buy the oozing goo punch but can't find it. But I like this punch and it worked well with my layout. 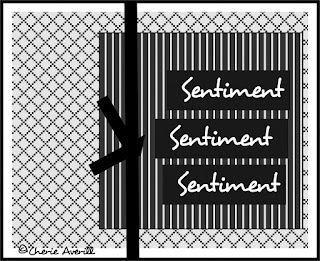 The sketch is from Sketch Inspirations although I think it is not a current sketch challenge any more. But I liked the sketch and decided to use for my layout. I used some scary pictures of my two older sons who both were a form of zombie for Halloween last year. 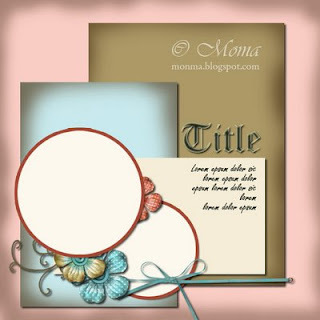 After I submitted it to Scrap Our Stash, I worried that maybe it wasn't a good subject matter but I guess it was okay since it has now posted over there. Hope you are having a good Saturday too. 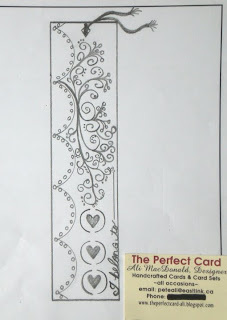 Here is a book mark I made for the Sketches4you Sketch A Thon that is going on now. This will be a little bit short because I need to go up to my ds school in a few minutes and listen to him give a speech to the 3rd, 4th and 5th graders. He is running for School Historian...which is perfect since the historian takes pictures and scrapbooks them!! I am so proud of him for putting himself out there and trying!! So don't forget to sign up for my blog candy and have a great day!! And wish him luck!! 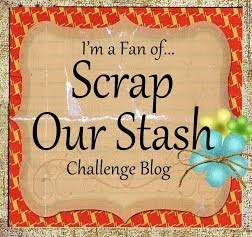 Denise at Vintage Scrappin http://www.vintagescrappin.blogspot.com/ is giving away CANDY!! Lots and lots of yummy candy. She is trying to reach 100 followers and she is almost there...you better run over and sign up now if you are interested. There were a couple of pre-SAT sketches...and I have posted the two I entered so far here on this blog already. The theme is to use either Back to School or something Fall. Halloween is in the fall so I used some photos from my 4 year olds school from last year. It is Halloween and the whole school goes outside and does the Monster Mash dance for the viewing pleasure of all their friends and family. It is super sweet and funny. Please rest assured that I didn't torture him and make him wear this for the actual Trick or Treating in our neighborhood. I found an old costume from one of his brothers that worked perfectly (and fit). And he was thrilled to bits. Anyway, I really love this sketch. I usually like the round ones for some reason. 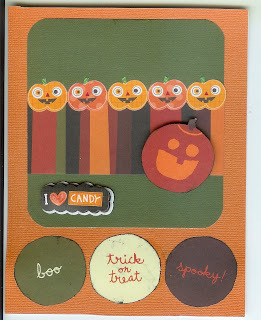 I have a ton of fun Halloween papers and embellies and just went to town on it. I think it turned out fairly cute. What do you think? Does your family celebrate Halloween? Sooooo it took me all day but I finally have something to post for your viewing pleasure. I really love all of Cherie's sketches!!!! Really, I do! 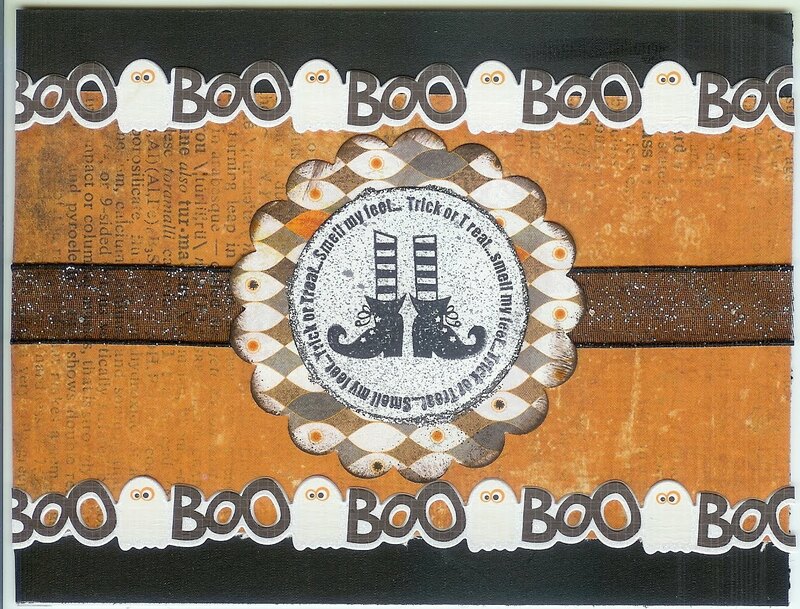 I made a Halloween Card with scraps from a layout I just made but haven't had time to photograph yet. I bought this ribbon at Michaels a while back and man have I been getting the mileage out of it! I have really been using the heck out of it. You wouldn't think it would match everything but it sure does. I used Pink Paislee pp Twilight or Dusk (can't remember which). I used some Crystal Stickles, a bit of bling. The stamp is from Recollections Halloween Clear Stamps. 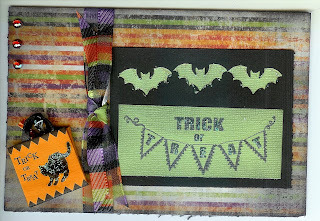 I actually had punched out the bats for my layout (that these scraps came from) and decided to just incorporate the punched out paper into my card. I backed it with the green paper and then stamped the image on the same green paper. 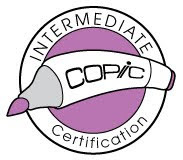 I inked the edges with Ranger Black Soot ink pad and inked the stamp with Ranger Archival Ink. 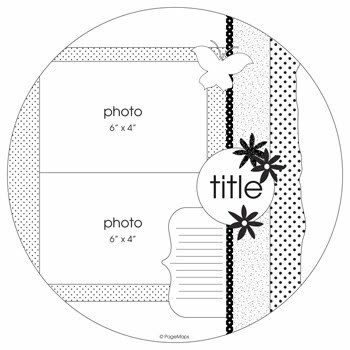 I used a cute little dimensional sticker from Jolee's Boutique. So there you go...something to look at on my blog again....FINALLY!! 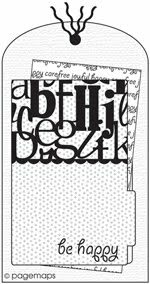 Don't forget that there is a Sketch a Thon going on at Sketches4you (link on my sidebar). Tons of prizes and sketches galore! Get over there and join in!!! We finished up our dd's adoption court stuff yesterday and it was such a wonderful feeling. We are very lucky parents. Our weekend away was wonderful and we enjoyed seeing all our old friends and just spending quality time with one of our kids. GDT will be Nikki Sivils & Cherie Averill!! Aren't we lucky????? I love them!!! Sketch A Thon starts today (!) Sept. 10th and ends Sept. 30th. 2nd place will receive a Goodie bag!! Sponsor prizes and RAK Giveaways!! There will be sketches posted every other day and you will have until Oct 1 to post them in the gallery for a chance to win. Most (if not all) of the sketches will have individual prizes too. The theme is Fall and Back to School! That leave you open to a million cool ideas. 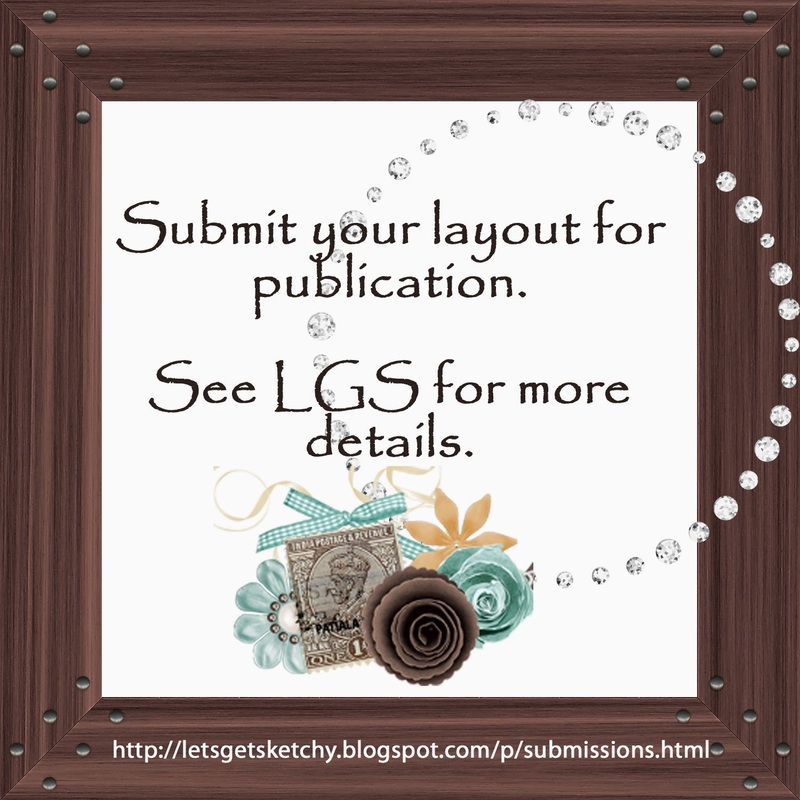 There will be layouts, cards, tags, bookmarks...so many fun, inspiring things to do. So click on the link either in this post or on my sidebar and join us!! 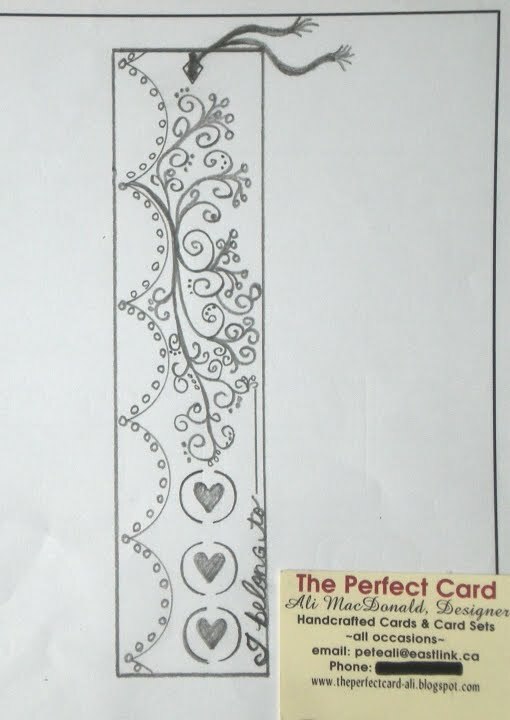 "My" card sketch will post on September 26th...be looking for it. Okay yesterday I mentioned that the Sketch-A-Thon at Sketches4you was getting ready to start that that they already sort of started by having a pre S-A-T lo sketch and a pre S-A-T tag sketch....well a little while later after I had already posted on my blog they added a pre S-A-T card sketch. I decided that since I was super busy yesterday getting ready to leave town again, I would do the card sketch. I will do the layout and try to play catch up with whatever else is posted when I get back home on Monday. All my pp is from that stack except for some Bazzill Basics (the red paper). I cut the cute saying out of a piece of pp in the stack too. 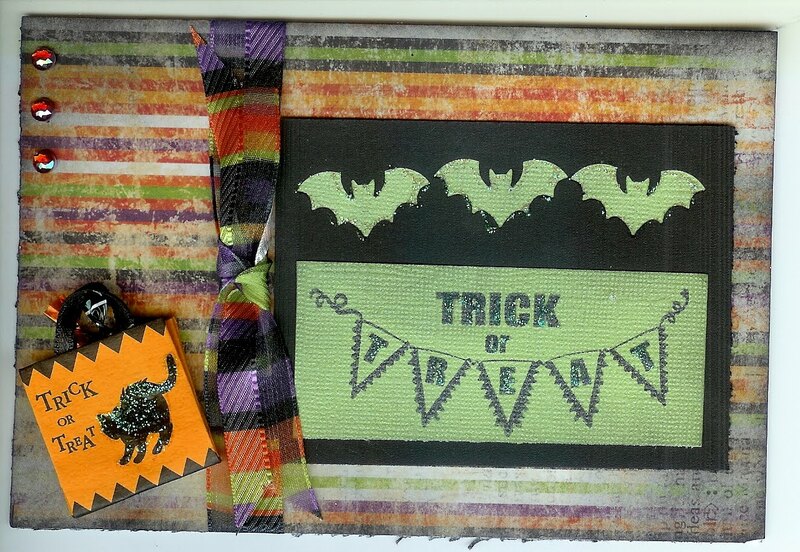 I added some ribbon from my stash and "stitched" around some of the paper with my lime green sharpie. 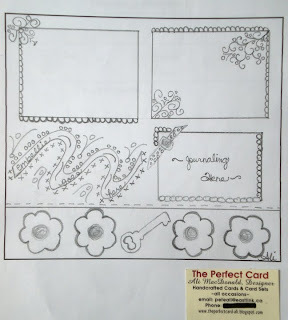 Here is also the pre Sketch-A-Thon layout sketch for you to drool over and make you want to rush to your crafting space. I am going to try to get it done myself in a few minutes and post it tomorrow. There should be a sketch posted in the Sketch A Thon every other day for the next 3 weeks. 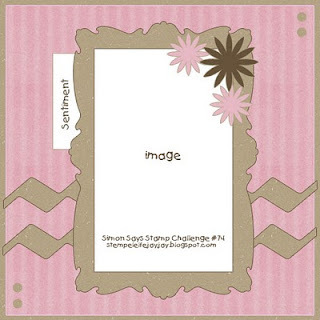 You will have until Oct 1 to post your creations at S4U. Come join in. There will be prizes and a Queen will be chosen. And it will just plain be good fun! So click on the link on my sidebar and join in.